Murdock cuts through the small talk: Foggy needs to 'die'. It takes Foggy off the radar of Daredevil's enemies, leaving him unencumbered to deal with his own fight against cancer. Foggy's unconvinced, unmotivated, and unhappy. The ongoing battle's taken more out of him than anything he's gone through before. 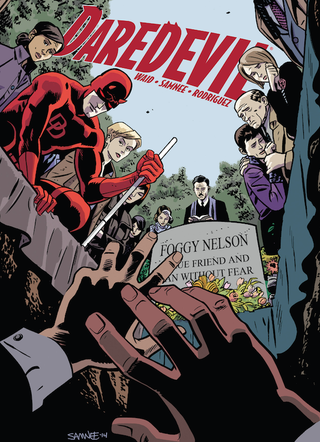 At the root of it, Foggy feels a bit insignificant compared to the big, dangerous battles Daredevil and his colleagues have fought: He thinks nothing of his own battle because the life he's saving is his own. Enter a giant machine-gun armed battle mech in leapfrog green. No, really. Matt and Foggy take off through the trees. Thank goodness the walking tank also has chainsaw appendages. Really. Comic books should be fun. Chris Samnee's work, paired with Javier Rodriguez' colors, make this ludicrous scenario every bit as fun as it can be. It's grand. This is not the same Leap-Frog that DD's faced in the past, more of a legacy character (I guess). The character's not explained overmuch, he may or may not have ties to the gang that attacked Murdock in Issue #1, also using borrowed tech. Time will tell. Anyway. The crisis escalates in record time: The hopping tank's driver is incapacitated, but Foggy's still inside... and the rig is set to explode. Foggy gets to be a hero (in his own terms), by driving the hopping tank high above the city, where it explodes at a (relatively) harmless altitude. Oh yeah. Ant Man's been along for the ride. Nice thing about having a size-changing superhero along for the ride. Explosions aren't so much a certain end if you can shrink between atoms. It does a fine job for staging a public demise, though. So Foggy has something he's never had before— the experience of saving lives. He gets to feel like a hero, when he's been one for years. Not everyone can see their true selves, sometimes. Foggy deserved a win, and he got one. Hopefully it'll tide him over until he triumphs over his cancer. Mark Waid and Chris Samnee have taken a subject that could have been extremely grim, and turned it into something uplifting, daring, exciting, and best of all, light. This is the new Daredevil. And I'm scrounging to find flaws. So far I'm comin' up nil.